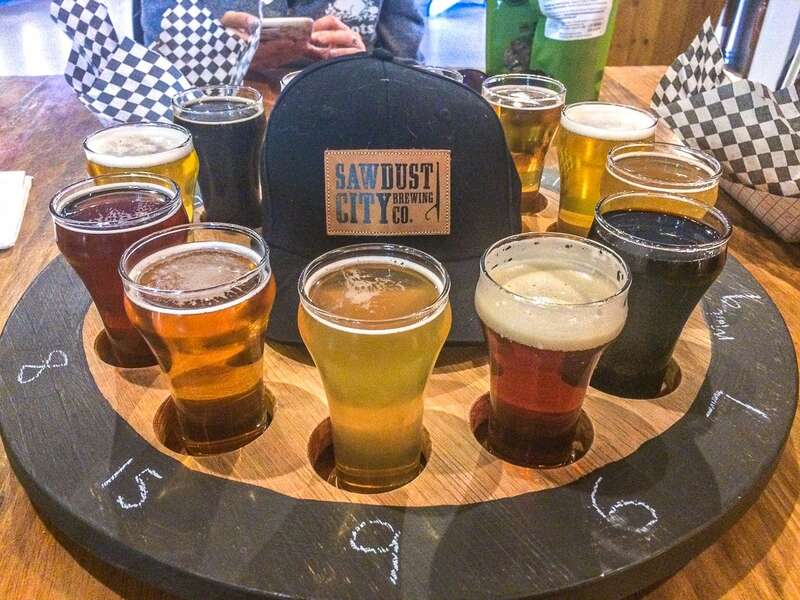 Sawdust City Brewery is a Classic Ontario Craft Beer Experience! Are you looking to try Ontario craft beer and are not sure which brewery to check out? Why not head to the heart of Muskoka to hang out at Sawdust City Brewing Co.? Located right in Gravenhurst, Sawdust City has been serving up creative cans and amazing beers – so much so that they have really made a name for themselves in the scene of Ontario craft breweries. Having only really been to larger breweries in Toronto, we were lucky enough to stop in for a visit in the summer. We are SO glad that we did! So, we wanted to share our experience at Sawdust City, tell you a little bit about them, and – of course – dive into what beers we sampled! If you want to check out their official website, you can do so here. If not, here’s our experience one afternoon trying out a few beers! Where is Sawdust City Brewing Co? Sawdust City Brewing is located in Gravenhurst, Ontario – right in the heart of the famed Muskoka region of Ontario (and Canada). Known as the heart of cottage country, the area is the place to go for amazing lakes, Ontario wilderness, Canadian culture, and summertime fun at the cottage. Gravenhurst is about 2 hours north of Toronto – traffic depending. Just take Highway 400 to Highway 11 and follow the cut offs for Gravenhurst. You can’t miss it – they have one of the largest “Muskoka” chairs in the WORLD at the front. Yes, you can climb on top and snap that photo. The facility in Gravenhurst is a massive 20,000 sq foot facility where all the magic happens. They do all the brewing, barrel-aging, canning, retail selling, and beer tasting in the Saloon bar onsite. Talk about a one-stop shop! Looking to Stay the Night? Ontario’s Finest Inns Await! The Backstory of Sawdust City Brewing Co.
Sawdust City Brewing Co was founded by two guys that had industry knowledge about the landscape of craft beer in Canada. They got together with an idea for a brewery in Gravenhurst that was sustainable and reflected the heart and ideas of the famous Muskoka region – and Sawdust City was born. Sawdust City has 6 core beer that are always available but they pride themselves on their creative drafts, seasonal flavours, special editions, and an all-around fun beer culture. Need a souvenir? Grab your gear and don’t forget some beer! Once you are inside, you enter a massive retail store with merchandise and fridges. If you just need a few cans or growlers, you can stop right here, grab them, and cash out in no time. If you want to stay for the experience, walk into the Saloon. The bar area is known as “The Saloon”. Filled with high and low tables with stools or chairs, the Saloon surrounds the massive pine log bar top and has large windows looking into the massive silver vast in the brewing area. At the one end, the bar area has a stage where Sawdust frequently does live music, bingo, and trivia. You can check the venue schedule for something that interests you! You can also do a brewery tour on Saturdays if you are interested and we’d say definitely sign up ahead in the summer to avoid disappointment. We didn’t do one, though – we just came to sample! Admittedly, we hadn’t had a ton of Sawdust City’s beer before heading to Sawdust City Brewery. We’ve had a lot of Ontario craft beer, but Sawdust was never really one of them. One of the reasons for this is the sheer selection available. The craft beer scene in Ontario has exploded in recent years so the competition is fierce and shelf space at the LCBO is at a premium. That’s why we’re glad we got to go to the actual brewery, see where it’s made, and learn about the beers. It was a way better experience and we’re more likely to spot it on the shelf next time. A dozen beer for two people – you can get less if you want! Choosing the beer was actually really hard. They have 18 taps to choose from. Here’s how you begin your tasting: You get a wheel, grab a piece of chalk, and write down the beer you want as per the beer list right in front of you. Then they get to work filling your wheel. Walking back to the table was a little nerve-wracking but we made it. Eric usually goes for a hoppy IPA but on this day he had the following beer: Ol’Woody Alt (Amber Lagered Ale), Titania Red Rocket (Bourbon Barrel Imperial Stout), Maple Buttertart (Flavoured Amber Ale), Coriolis Effect (Sour Berlinerweisse, A Place to Stand (Ontario Lager), and Fruits of Eden (Fresh Hop Pale Ale). To briefly sum up, the Imperial Stout was 11.9% and a tad too strong in flavour – it finished thick and full of bourbon. He was also full of poutine so he didn’t finish it. Both lagers were nice (preferred the Ol’Woody) as was the Pale Ale. The Sour and the Buttertart were just to try some different fun flavours. Both were great – the sour was low percentage but very flavourful. Sawdust does small snack-style food onsite in the Saloon, but don’t count on it for a whole meal. These smaller eats are just meant to pair with some of their beer choices. If you need food, you’ve got another option right outside. Located in the parking lot outside is a food truck by Grillicious – and WOW are they good! The Grillicious food truck has some seating and an extensive menu of classic Canadian eats as well as other pub-style foods. We had pulled pork poutine and honestly our mouths are watering again just thinking about it as we write this. It was SO GOOD. Eric considers himself a poutine connoisseur – and this was top notch. You can check out their site above if you want to know what to order ahead of time. One of the perks of the food truck was that you order outside and take a number inside into the brewery. Then, as if like magic, they will bring you your food. It’s a nice little bit of teamwork by Sawdust and Grillicious: both the brewery and the food truck benefit and everyone leaves full of food and beer. The Verdict – to Visit or Not to Visit Sawdust City? And there you have it – a little bit about our visit to Sawdust City Brewery. In the end, you come for the beer and to appreciate the work they put into their craft. Sawdust City did not disappoint. The beer was great, the staff were super friendly, the place was accessible and pet-friendly (we had a dog and there is a dog-friendly table inside). Everyone in the place (it was busy for a Saturday mid-afternoon in the fall) was genuinely having a good time. Shout out to Sawdust City for a great afternoon – we definitely recommend checking them out… we know we’ll be back!